Happy Thursday!! 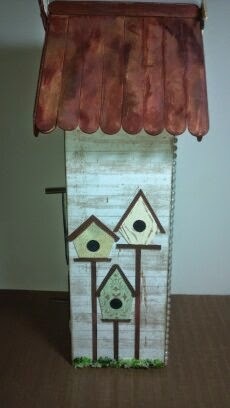 Today I have a "bird house" to show you using the 2 Story House from Gina's Designs. After the house was assembled, I applied a coat of gesso. My next step was to extend the roof line. 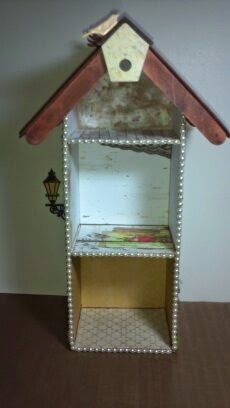 Since Gina designed it as a shadow box, the "back" side is made to be flat against a wall. I wanted to use it as storage and to be able to turn it around to hide the inside. I took a piece of heavy card stock to make the overhang match the other side. 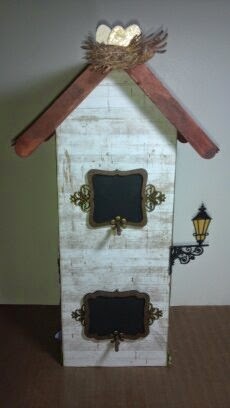 On one side of the house are three birdhouses from the "For the Birds" set. I embossed one and stenciled the other two. On the other side I placed one of our leafy branches that I turned into a tree. I painted the trunk and branches, and covered the leaves with flower soft. Inside the house, I covered each "room" with different paper and did a faux painting technique in the "attic". 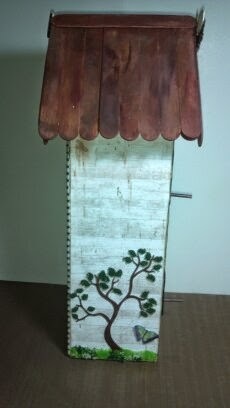 The bird on the birdhouse on the roof peak is from the Spring Shape Set. I plan on using the house to store my bling from Joann's. 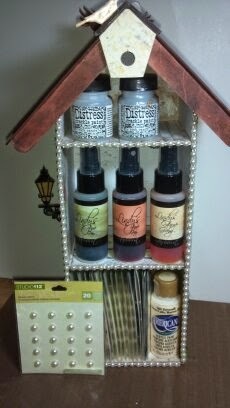 You could also store paint bottles on the bottom and middle shelves and your Lindy's sprays will fit on the middle shelf ! Thanks for stopping by the blog today. The links to all of the products I used from Gina's Designs are listed below.